The SIRIUS line covers the range from 30kVA to 2000kVA and allows for the choice of several input voltage variation percentages within a broad range from +30% up to -45%. 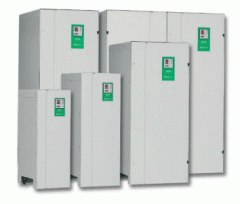 The SIRIUS voltage stabilisers are supplied with independent regulation on each phase. The SIRIUS type is used when the main is unbalanced and when unbalanced three-phase loads and/or single-phase loads need to be supplied. In this situation the presence of the neutral wire is required. The stabilisers are air cooled (natural convection with cabinet internal temperature lower than 40°C).